Our angle iron with aluminum face signs are great for heavy duty applications or in cases where you need long term signage. They are great for professional real estate agents and contractors. Thee frames are made from angle iron and are coated with a glossy black powder coating that is virtually rust proof. The sign face itself is comprised of powder coated aluminum with a glossy white finish. We customize the sign with 7-10 year vinyl graphics that are bonded to the surface of the sign. We offer them in both single and double sided formats. You can also add a name rider to the signs for a more professional look. If you have any questions prior to ordering, please feel free to call us at 866-769-7446 or e-mail us. Our angle iron and aluminum signs are made from heavy duty materials and are perfect for contractor job sites or small businesses that are in a residence. They measure 24"x18" and have an additional space that can accommodate a 24"x6" name rider sign. 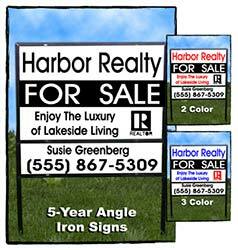 A proof of the design for your angle iron and aluminum yard signs will be generated for you to preview or make changes to. The preview of your signs will be sent as an attachment to your e-mail address within 24 hours. You can also enter special instructions you may have regarding the layout of your angle iron yard signs on the next page.